The zombie apocalypse is never a terribly pleasant event, but there are degrees to which its severity can play out on film. In most cases, it’s a violent affair, one plagued by terror, destruction, and a fair deal of flesh-eating. That’s not to suggest that it can’t also be told as a more sentimental story, something that “The Walking Dead” does on occasion, with the inevitability of one’s transformation into the walking undead a more dramatic, drawn-out process. That is the epitome of “Maggie,” an independent drama starring a typical choice for this kind of universe in an atypical role, Arnold Schwarzenegger. Schwarzenegger stars as Wade, one of the more serious characters the actor has played, a devoted father who drives across a barren dystopian landscape searching desperately for his daughter Maggie (Abigail Breslin). Infected crops are identified as the cause of a major virus that is spreading quickly and has already reached Maggie. Signs of deterioration are clearly enumerated in pamphlets distributed at the hospital, and when an infected person reaches a certain point, they are swept up for what promises to be a brutal period of quarantine before their ultimate demise. 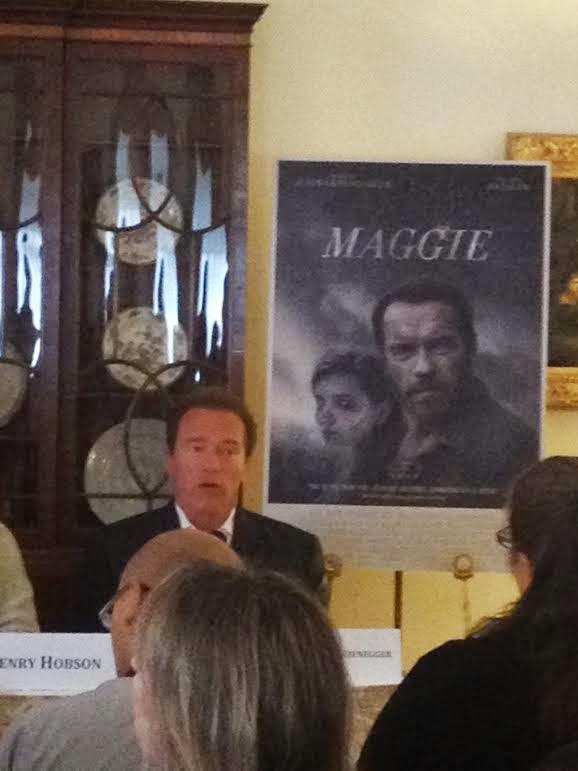 Knowing Schwarzenegger, he would only play someone who would never take no for an answer, and therefore it should come as no surprise that Wade is not eager to let his daughter go quietly and believes firmly that he can protect her in a way that no one else can. 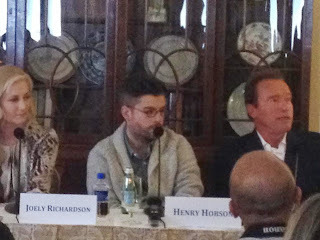 During a press conference in April, Schwarzenegger entertained the crowd of journalists with a humorous attitude towards a serious subject, praising the efforts of debut feature film director Henry Hobson is commanding the respect and commitment of the entire crew in crafting this unusual spin on the zombie film. Premiering at the Tribeca Film Festival already sets this film apart from typical Schwarzenegger fare, expressing a level of intent and cinematic quality not often found in his action pieces of late. Yet despite that artistry, this still is not a fully compelling film, one whose premise doesn’t last long as it plods along a predictable course. Schwarzenegger is perfectly cast, which doesn’t necessarily translate to a great performance, and Breslin, an Oscar nominee for “Little Miss Sunshine” at age eleven, continues to display her impressive array of skills. 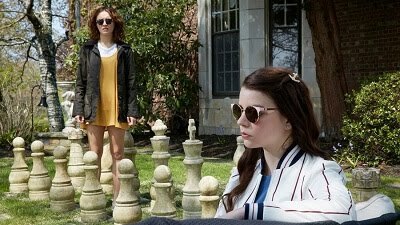 This was never meant to be an acting showcase or a truly groundbreaking film, and it serves as decent entertainment even if it’s not the thoughtful drama it was intended to be.